MCNs are common in middle-aged women, are usually well defined, and are predominantly in the tail of the pancreas (>90%). Compared with serous cystic tumors, MCNs are larger (>20 mm in diameter) and less numerous (usually < 6). The biologic behavior of MCNs is variable, and different histologic patterns frequently coexist in the same tumor. The tumors may be entirely benign, as are mucinous cystadenomas or intraductal papillary mucinous adenomas. Some tumors are borderline, showing cellular dysplasia, whereas others are frankly malignant. Malignant cystadenocarcinoma and intramedullary mucinous carcinomas may be further subdivided into noninvasive and invasive types. 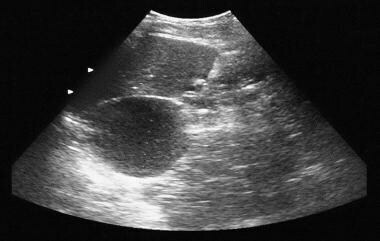 Sonogram through the left hypochondrium shows a large septate mass anterior to the kidney (K). Nonenhanced axial CT scans. Image 1 shows a large septate mass in the left hypochondrium. Note the smooth external contour typical of a mucinous cystic neoplasm. On the basis of involvement of the pancreatic duct, IPMNs are classified as either main duct IPMN, side-branch IPMN, or mixed variant IPMN involving both the main pancreatic duct and the side branches. Main duct IPMNs often have intestinal-type epithelium, and side-branch IPMNs usually have gastric-type epithelium. Although all morphologic variants of IPMN can progress to cancer, invasive adenocarcinoma originating in gastric-type IPMNs is associated with a significantly worse survival rate than that originating from other types of IPMNs. However, the imaging features are not specific for differentiating the various histologic variants of IPMNs. Side-branch IPMNs are commonly detected in older men and are more frequently located in the proximal pancreas (head and uncinate process). An important differentiating feature between MCN and IPMN is visualization of pancreatic ductal communication. If a clear channel of communication with the pancreatic duct is visualized, the diagnosis of side-branch IPMN is almost certain because SCAs and MCNs do not communicate with the pancreatic ductal system. Despite the low incidence of aggressiveness of mucinous cystic lesions 3 cm and smaller, the incidence is not low enough to dismiss the lesions entirely, and careful review of the imaging features is mandated. In addition, patients whose condition is found not to be suitable for surgical management often need frequent assessments for growth and change in imaging features. Pancreatic intraductal papillary mucinous tumor (IPMT). 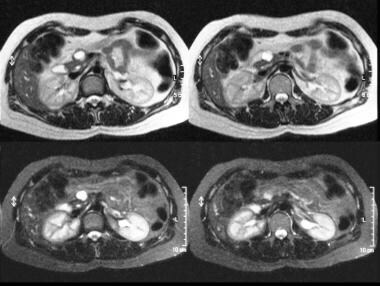 Contrast-enhanced axial CT scans through the pancreas show a 5.5-cm cystic tumor in the pancreatic head. Note the upstream, gross dilatation of the pancreatic duct. The accessory pancreatic duct is also dilated. Pancreatic intraductal papillary mucinous tumor (IPMT). 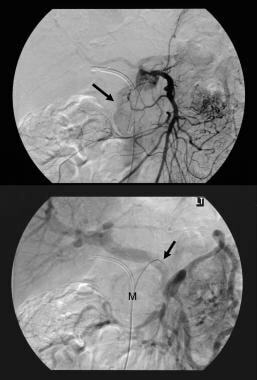 (Top) Superior mesenteric angiogram shows capillary vascularity in the mass in the pancreatic head during the arterial phase. (Bottom) The portal venous phase image shows displacement of the portal venous branches and encasement of the junction of the superior mesenteric vein and the portal vein. M denotes the pancreatic mass. Pancreatic intraductal papillary mucinous tumor (IPMT). Contrast-enhanced axial CT scans through the pancreas show a multiseptate tumor in the head of the pancreas. Pancreatic intraductal papillary mucinous tumor (IPMT). Contrast-enhanced CT scans through the pancreas show gross dilatation of the pancreatic duct. At surgery, IPMT was confirmed. Serous cystadenomas (microcystic adenomas) (see the images below) are the second most common cystic tumors of the pancreas. The clinical presentation of serous cystadenomas is similar to that of mucinous cystic pancreatic tumors. Pancreatic microcystic adenoma. Plain radiograph shows tumor calcification in a microcystic adenoma (left upper quadrant). Calcification in the microcystic adenoma presents as a central cluster arranged in a sunburst or stellate arrangement. Central calcification is better evaluated with CT than with radiography. Pancreatic microcystic adenoma. Sonogram shows a cystic mass in the region of the tail of the pancreas. Pancreatic microcystic adenoma. Contrast-enhanced axial CT scans show a hypervascular tumor in the pancreatic tail with sunburst calcification. Note the Swiss-cheese enhancement. Because of increasing use of cross-sectional imaging, many of these tumors are detected as an incidental, asymptomatic finding. On cross-sectional images, serous cystadenomas appear as numerous tiny cysts separated by delicate fibrous septa, which give them a honeycomb appearance. The cysts are filled with clear, watery fluid and are often arranged around a central stellate scar, which may be calcified. On CT scans, sunburst central calcification in a spongy mass is pathognomonic of this tumor, but this finding occurs in only 10% of patients. Endoscopic ultrasonography (EUS) allows better resolution of the honeycomb structure than does CT. At times, the cysts may be large, a feature that makes it difficult to differentiate these cysts from MCNs. Hypervascularity may be demonstrated on angiograms, and some tumors occur with intra-abdominal hemorrhage. Fluid collections occur in as many as 50% of cases of acute pancreatitis. 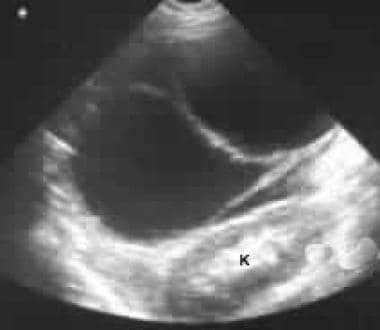 Pseudocysts are usually seen as anechoic fluid spaces on sonograms, but they may show internal echoes if they contain necrotic tissue or clot. Imaging findings that suggest a diagnosis of pseudocyst rather than of cystic neoplasm include the following: lack of septae, loculations, solid components, or cyst-wall calcifications on computed tomography (CT) scans; hypovascularity on angiograms; and communication between the cyst and pancreatic ducts on endoscopic retrograde cholangiopancreatography (ERCP). Most pseudocysts are extrapancreatic, whereas pancreatic cystic neoplasms are intrapancreatic. Pancreatic abscess is usually secondary to infection of a pseudocyst, but in rare cases, it can occur as a result of direct spread from renal or colonic infection. Typically, a pancreatic abscess occurs 2-4 weeks after an episode of acute pancreatitis. On images, these abscesses may appear similar to pseudocysts. Generally, the appearance depends on their age. In the acute phase, the changes may be subtle, with only loss of normal pancreatic contour associated with obliteration of the pancreatic outline and the peripancreatic vascular and other soft tissue spaces. These changes may be indistinguishable from those found in severe acute pancreatitis. In the subacute and chronic stages, when central necrosis occurs, an anechoic or complex cystic mass is usually seen. A debris level may be observed in the dependent portion of the abscess. In the subacute or chronic phase, through transmission is usually good except when gas is present within the abscess. In the presence of gas, the abscess may become echogenic and may shadow. The walls of subacute and chronic pancreatic abscess have variable features. The walls may be thick, irregular, and well defined, or the abscess may have no definable wall at all. The sonographic findings are nonspecific, but in the appropriate clinical setting, a diagnosis of an abscess may be suggested and confirmed by means of percutaneous aspiration or CT.
Echinococcus granulosis cysts and multilocularis cysts of the pancreas have been described, although pancreatic involvement is exceptionally rare. E. granulosis cysts may be unilocular, multilocular, or complex cystic. On imaging alone, differentiation of these and other cystic masses is difficult. Serologic tests may be useful in the appropriate clinical setting. 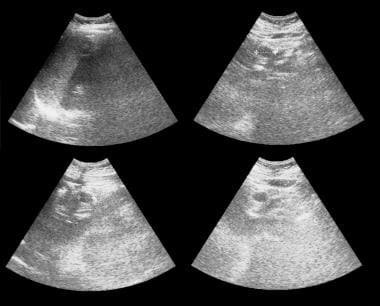 E. multilocularis cysts show an echogenic infiltrative pattern. This diagnosis should be entertained in endemic regions when such a pattern is seen. Solid and papillary epithelial neoplasm of the pancreas may be solid or cystic. These are rare tumors that are often mistaken for mucin-secreting tumors or nonfunctioning adenomas. Solid and papillary epithelial pancreatic tumors are most often located in the pancreatic tail. They are large, well-encapsulated masses with areas of hemorrhage and necrosis. On sonograms, they appear as heterogeneous, round, solid masses with a cystic necrotic center and dystrophic calcification, which may shadow. Dysontogenic cysts are hamartomatous cysts that are often associated with renal cysts, cerebellar angiomas, and encephaloceles. Imaging reveals a large, thin-walled cyst with a mulberry configuration. Pseudoaneurysms are usually not truly intrapancreatic, and they may be confused with a pancreatic cyst. 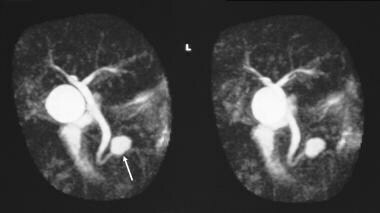 These aneurysms are a complication of pancreatitis in 3.5-10% of patients. Doppler sonography may show turbulent arterial flow within a pseudoaneurysm, whereas color flow Doppler sonography shows bidirectional flow and swirling within the anechoic mass. Doppler imaging may permit tentative identification of the artery feeding the pseudoaneurysm. These tumors may be hyperechoic or hypoechoic/cystic lesions with sporadic internal echoes. This is a common feature in larger tumors in which cystic degeneration and hemorrhage have occurred. 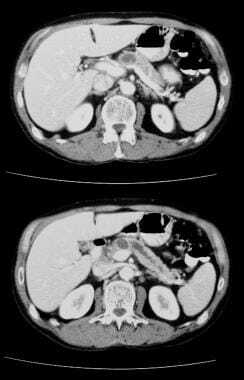 The tumors are retroperitoneal but may mimic pancreatic masses. Pancreatic sarcoma is a rare tumor of the mesenchymal supporting structures of the pancreas. It is a relatively sonolucent mass and may be mistaken for a fluid collection or pseudocyst. Sonographic results may be normal, or sonograms may demonstrate a retroperitoneal mass, which is relatively sonolucent compared with the surrounding tissues. Therefore, this lesion may be confused with a cystic pancreatic mass. Primary pancreatic lymphoma is rare. The clinical presentation is not unlike that of pancreatic carcinoma. Sonography may reveal a homogeneous, sonolucent, or complex mass. These masses are usually echo-poor and may mimic cystic lesions. As the prognosis of a pancreatic lymphoma is favorable, its differentiation from a carcinoma is crucial. The correlation of sonographic, CT, and angiographic findings may result in a correct diagnosis. However, if doubt exists, sonography-guided biopsy may reveal the true nature of the mass. MRI is the preferred technique for the diagnosis of cystic pancreatic tumors. MRIs are usually helpful in differentiating between pseudocysts and cystic neoplasms. [3, 6] Magnetic resonance cholangiopancreatography (MRCP) can depict biliary and pancreatic duct anatomy noninvasively, and it helps in the diagnosis of intraductal tumors. In equivocal cases or in cases in which malignancy is highly suspected, EUS-FNA gives the best diagnostic yield, as it permits the acquisition of cytologic samples and cystic fluid for the analysis of various tumor markers. Occasionally, despite complete evaluation of a cystic mass, the type of cyst may remain indeterminate. Although expensive and invasive, laparoscopic sonography, biopsy of the cyst wall, and analysis of the cystic aspirate significantly contribute to the differential diagnosis of pancreatic cystic lesions. CT shows tumor calcification and is an excellent modality for the detection of local and distant metastases. Although CT and MRI cannot be used to differentiate mucin content from pancreatic juice, communication between the cystic lesion and the dilated MPD and a bulging papilla with a patulous orifice are characteristics of IPMT. The internal architecture of mucinous tumors is displayed at least as well on MRI scans as it is on CT scans, with the exception of calcification within the lesion (which MRI has only a limited ability to reveal). Spiral and/or multisection CT are excellent techniques for imaging the pancreas, providing superb spatial resolution and anatomic detail. With thin collimation and arterial and venous phases and multiplanar and/or 3-dimensional (3D) reconstructions, excellent detail of the vascular anatomy is depicted; most centers now seldom use angiography to assess pancreatic tumors. Plain radiographs are often obtained to look for pancreatic calcification. Upper GI barium studies may be performed in the context of epigastric pain. With pancreatic tumors, barium studies may depict extrinsic displacement of the stomach and duodenum. Plain radiographs and upper GI barium studies are nonspecific, and similar findings may be encountered in a variety of pathologies. CT carries a significant ionizing radiation burden and uses iodinated contrast material with a risk of anaphylaxis and nephrotoxicity. Cross-sectional studies, including ultrasonography, CT, and MRI, cannot be used to distinguish between mucinous cystadenoma and cystadenocarcinoma unless the tumor has metastasized or invaded neighboring organs. Angiography is nonspecific and invasive. It also requires iodinated contrast medium, with the risk of anaphylaxis and nephrotoxicity. When there is suspicion of malignacy or concomitant pancreatic cancer and when assessment of vascular involvement, peritoneal disease, or metastatic disease is required. Plain radiographs may show tumor calcification in 10-15% of cases of microcystic adenomas. Calcification in microcystic adenoma presents as a central cluster arranged in a sunburst or stellate arrangement (as seen in the image below). In mucinous-type tumors, calcification tends to occur at the periphery of the tumor or in the walls of the cysts and to appear curvilinear. CT is more sensitive for detecting calcification than is plain radiography. Upper GI barium studies are nonspecific and usually show extrinsic displacement of the stomach or duodenum. As most symptomatic cystic neoplasms are large, these findings are not infrequent. ERCP in MCN rarely shows cyst communication with pancreatic ducts, but it frequently shows duct displacement by mass effect or ductal obstruction. 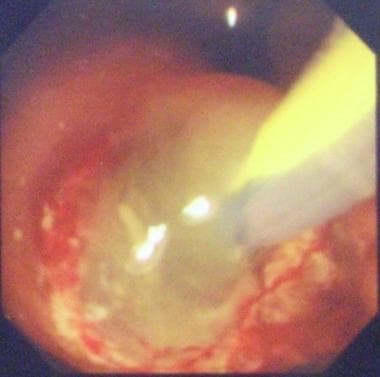 ERCP typically shows a patulous ampulla of Vater with discharging mucus, which is often diagnostic for IPMT. There are several causes of calcification in the pancreatic bed; these include chronic pancreatitis, pancreatic hemorrhage, abscess, infarction, hyperparathyroidism, cystic fibrosis, and kwashiorkor. Many pancreatic tumors can become calcified, including adenocarcinoma (rare), islet cell tumor, microcystic adenoma–sunburst calcification, MCN (macrocystic cystadenoma), cavernous lymphangioma, hemangioma, and colonic carcinoma metastases. Abnormalities on upper GI barium series are also nonspecific and can be caused by many neoplastic and nonneoplastic masses near the stomach and duodenum. Pancreatic duct calculi and chronic pancreatitis may mimic IPMT, and vice versa. Nonenhanced CT scans of mucinous cystic neoplasms show a well-defined, unilocular or multilocular, externally smooth, round-to-ovoid mass with fluid attenuation. Enhanced axial CT scans show a large septate mass in the left hypochondrium with rim enhancement and enhancement of the septa. At surgery, a mucinous adenoma was confirmed. Note the smooth external contour typical of a mucinous cystic neoplasm. Nonenhanced (left) and contrast-enhanced axial CT scans through the pancreas. These scans confirm the presence of a cystic mass in the anterior part of the head of the pancreas. The contrast-enhanced image shows a septum within the mass. At surgery, a mucinous adenoma was confirmed. Visualization of nodular or papillary excrescences with irregular borders of the septa is possible. If present, calcification is curvilinear or punctate and confined to the cyst wall or septa. Contrast-enhanced CT scans show enhancement of the cyst wall, internal septations, mural nodules, and other intracavitary projections. CT may also allow the identification of solid components associated with cystic elements, which are features of borderline or malignant tumors but not benign variants. CT more clearly demonstrates enhancement of cystic walls and septa than do other studies. In the early stages of focal or segmental involvement by IPMN, the features may be difficult to differentiate from focal chronic obstructive pancreatitis on cross-sectional imaging. 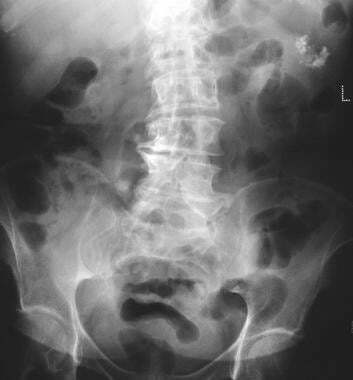 In these cases, the findings on ERCP may be diagnostic. Rarely, segmental pancreatic duct dilatation may acquire a cystic appearance, whereas the MPD and the rest of the pancreas appear normal. Cases with a cystic appearance may mimic a peripheral MCN. However, with a peripheral MCN, the pancreatic duct is almost always normal in appearance. When the tumor involves the head of the pancreas, imaging reveals upstream dilatation of the pancreatic duct. IPMN can be more confidently diagnosed when imaging reveals a filling defect in the main duct or a branch pancreatic duct. The filling defects are hyperechoic on sonograms, high attenuating on CT scans, and hypointense on T2-weighted MRIs relative to the surrounding fluid. When there is diffuse involvement of the MPD, dilatation is present along the whole length of the pancreatic duct. This dilatation is often associated with diffuse and generally uniform pancreatic atrophy. These features may be difficult to differentiate from those of chronic pancreatitis. However, dilatation of a branch duct is a frequent finding in IPMN, and the presence of mural nodules and mucin blobs is another finding that may be a clue to the diagnosis. In late cases with advanced disease, mass effect from the tumor may cause common bile duct (CBD) compression and dilatation of the biliary tree and compression or displacement of the stomach and duodenum. Pancreatobiliary fistula may be a late complication. Advanced stages of the disease may be complicated by pseudomyxoma peritonei as a result of dissemination of the disease to the peritoneum and retroperitoneum. Peritoneal seedlings can be identified as small foci that appear hyperechoic on sonography and hyperattenuating on CT.
Branch-duct IPMNs may be easier to identify than main-duct IPMNs, as the former generally appear as mass lesions on imaging. When these lesions are small, they are commonly an incidental finding in patients undergoing imaging for unrelated conditions. Branch IPMN is most frequently encountered in the region of the uncinate process. Branch IPMN may be microcystic or macrocystic. The microcystic variety may mimic serous cystadenomas/cystadenocarcinomas on imaging, but communication with the MPD (which is frequently dilated) may be a clue to the diagnosis. The macrocystic variety must be differentiated from other cystic masses. The thickness of the cyst wall and septa is variable with benign tumors; they tend to be thin and regular. In malignant tumors, the walls and septa appear irregular and thick, with solid nodules. CT findings can be highly specific and are usually sufficient for a confident diagnosis. Bulging of the papilla into the duodenal lumen is virtually diagnostic of IPMT and is well demonstrated with CT and MRI. CT is not useful for differentiating mucinous cystadenoma from cystadenocarcinomas, with the exception that papillary excrescences suggest malignancy and metastases prove malignancy. Mural nodules in IPMN can be difficult to differentiate from mucin blobs, as a clear attachment of the mural nodules to the pancreatic duct wall must be demonstrated; this may be difficult to define. However, mural nodules tend to enhance after the intravenous administration of contrast material, whereas mucin blobs do not. When IPMN involves the entire MPD, differentiation from chronic pancreatitis may not be possible on imaging. Bronchogenic cysts of ventral foregut origin can migrate into the abdomen prior to fusion of the diaphragm. These cysts can easily be misinterpreted as benign and malignant retroperitoneal lesions. Both mucinous cystic neoplasms and bronchogenic cysts can undergo malignant transformation. They can also become infected and hemorrhagic. With increasing use of high-resolution cross-sectional imaging, it is likely that more of these lesions may be recognized. The final diagnosis is offered by the histologic presence of ciliated respiratory epithelium and cartilage on pathology. MRI is an excellent modality for the depiction of cystic pancreatic masses, showing their internal architecture to advantage. As with other cross-sectional imaging techniques, several mimics of MCN can be depicted on MRIs. These include benign and malignant neoplastic cysts and cysts of inflammatory origin. The radiologic findings on cross-sectional imaging correlate well with the macroscopic features of mucinous cystadenoma and cystadenocarcinoma. Cystic lesions in MCN are hypointense or hyperintense on T1-weighted MRIs depending on protein content. Breathing-independent T2-weighted images, such as half-Fourier acquired single-shot turbo spin-echo (HASTE) images, show multiple hyperintense cysts separated by multiple hypointense septa. Intracystic excrescences and mural nodules also have low signal intensity, but they enhance significantly with gadolinium-based contrast agents. T2-weighted (top) and short-tau inversion recovery (STIR) (bottom) MRIs through the pancreas show a hyperintense lesion in the head of the pancreas. At surgery, a mucinous adenoma was confirmed. Magnetic resonance cholangiopancreatogram (MRCP) shows a cystic mass in the region of the head of the pancreas. At surgery, a mucinous adenoma was confirmed. Gadolinium-based contrast agents have been linked to the development of nephrogenic systemic fibrosis (NSF) or nephrogenic fibrosing dermopathy (NFD). For more information, see Nephrogenic Systemic Fibrosis. The disease has occurred in patients with moderate to end-stage renal disease after being given a gadolinium-based contrast agent to enhance MRI or MRA scans. NSF/NFD is a debilitating and sometimes fatal disease. Characteristics include red or dark patches on the skin; burning, itching, swelling, hardening, and tightening of the skin; yellow spots on the whites of the eyes; joint stiffness with trouble moving or straightening the arms, hands, legs, or feet; pain deep in the hip bones or ribs; and muscle weakness. For more information, see Medscape. MRCP allows depiction of pancreatic duct or CBD changes that may be associated with the tumors. Differentiation between serous and mucinous neoplasms may be difficult on MRIs, as there is variability in the MRI appearance of serous cystadenomas and overlap with mucinous neoplasms. CT criteria can be applied to MRI, except that calcification is often missed on MRI. Most serous tumors require histologic confirmation. MRCP is useful in differentiating between benign and malignant mucinous tumors, including IPMT of the pancreas. The presence of mural nodules is suggestive of malignancy; however, the absence of mural nodules does not indicate that the tumor is benign. Axial and sagittal sonograms through the pancreas show a 1.93-cm cystic mass in the head of the pancreas. At surgery, a mucinous adenoma was confirmed. Microcystic adenomas (serous cystadenoma), an example of which is seen below, are mostly complex, with numerous internal echoes resulting in the appearance of an externally lobulated solid mass, sometimes with good through transmission. The central scar and calcification may be demonstrated on CT scans but are not well depicted on sonograms. Although histologic studies remain the criterion standard for the differential diagnosis of pancreatic tumors, Rickes et al concluded in a report that echo-enhanced power Doppler sonography has a high sensitivity and specificity for such diagnosis. In their study, the authors selected 137 patients with a mean age of 60 years and clinically suspected pancreatic tumors. The patients were assessed with conventional sonography and nonenhanced and echo-enhanced power Doppler sonography. The sensitivity of echo-enhanced power Doppler sonography with respect to diagnosing pancreatic carcinoma was 87%, and its specificity was 94%. The corresponding values for chronic pancreatitis were 85% and 99%, respectively. EUS appears to be reliable in distinguishing between most benign lesions and neoplastic cystic lesions. In equivocal cases or in cases in which malignancy is highly suspected, EUS-guided FNA gives the best diagnostic yield, as it permits the acquisition of cytologic samples and cystic fluid for the analysis of various tumor markers. When the lesion is differentiated from other cystic masses and when the tumors are large and symptomatic, the best course of action is surgical resection. When small cystic lesions are encountered in asymptomatic patients, follow-up EUS may suffice. There is a wide differential diagnosis of cystic lesions in the pancreas, and therefore, the potential for false-positive results is significant. For smaller cystic lesions, a false-negative finding is possible in obese patients or in patients with gaseous distention. Sperti et al concluded in a study that fluorodeoxyglucose (FDG) positron emission tomography (PET) is more accurate than CT scanning in identifying malignant pancreatic cystic lesions and should be used, in combination with CT and tumor marker assay, in the preoperative evaluation of patients with pancreatic cystic lesions. In 56 patients with a suspected cystic tumor of the pancreas, values for sensitivity, specificity, and positive and negative predictive values for FDG-PET in detecting malignant tumors were 94%, 97%, 94%, and 97%, respectively. For CT scanning, these values were 65%, 87%, 69%, and 85%. A study by Sendler and associates, however, indicated that PET does not allow the precise exclusion of malignant tumors and that, therefore, the use of invasive diagnostic procedures may not be reduced by employing this modality. In their study, FDG-PET was performed in 46 patients admitted to the hospital for pancreatic tumor surgery,  and the resulting values for sensitivity and specificity were 86% and 67%, respectively. Kromrey ML, Bülow R, Hübner J, Paperlein C, Lerch MM, Ittermann T, et al. Prospective study on the incidence, prevalence and 5-year pancreatic-related mortality of pancreatic cysts in a population-based study. Gut. 2018 Jan. 67 (1):138-145. [Medline]. [Full Text]. [Guideline] Megibow AJ, Baker ME, Morgan DE, Kamel IR, Sahani DV, Newman E, et al. Management of Incidental Pancreatic Cysts: A White Paper of the ACR Incidental Findings Committee. J Am Coll Radiol. 2017 Jul. 14 (7):911-923. [Medline]. [Full Text]. [Guideline] European Study Group on Cystic Tumours of the Pancreas. European evidence-based guidelines on pancreatic cystic neoplasms. Gut. 2018 May. 67 (5):789-804. [Medline]. [Full Text]. [Guideline] Tempero MA, Malafa MP, Al-Hawary M, et al. Pancreatic Adenocarcinoma, Version 3.2017, NCCN Clinical Practice Guidelines in Oncology. National Comprehensive Cancer Network. Available at https://www2.tri-kobe.org/nccn/guideline/pancreas/english/pancreatic.pdf. September 11, 2017; Accessed: October 3, 2018. Tian L, Lv XF, Dong J, Zhou J, Zhang Y, Xi SY, et al. Clinical features and CT/MRI findings of pancreatic acinar cell carcinoma. Int J Clin Exp Med. 2015. 8 (9):14846-54. [Medline]. [Guideline] Elta GH, Enestvedt BK, Sauer BG, Lennon AM. ACG Clinical Guideline: Diagnosis and Management of Pancreatic Cysts. Am J Gastroenterol. 2018 Apr. 113 (4):464-479. [Medline]. [Full Text]. Pai M, Habib N, Senturk H, Lakhtakia S, Reddy N, Cicinnati VR, et al. Endoscopic ultrasound guided radiofrequency ablation, for pancreatic cystic neoplasms and neuroendocrine tumors. World J Gastrointest Surg. 2015 Apr 27. 7 (4):52-9. [Medline]. Brugge WR. Diagnosis and management of cystic lesions of the pancreas. J Gastrointest Oncol. 2015 Aug. 6 (4):375-88. [Medline]. Grenacher L, Klauss M. [Computed tomography of pancreatic tumors]. Radiologe. 2009 Feb. 49(2):107-23. [Medline]. Fisher WE, Hodges SE, Yagnik V, Morón FE, Wu MF, Hilsenbeck SG, et al. 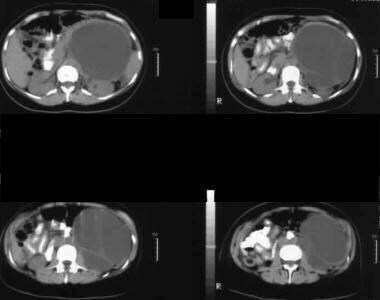 Accuracy of CT in predicting malignant potential of cystic pancreatic neoplasms. HPB (Oxford). 2008. 10(6):483-90. [Medline]. Hong TM, Lee RC, Chiang JH. Intraductal papillary mucinous tumor of the pancreas: computerized tomography and magnetic resonance imaging features. Kaohsiung J Med Sci. 2003 Feb. 19(2):55-61. [Medline]. Kluger MD, Tayar C, Belli A, Salceda JA, Van Nhieu JT, Luciani A, et al. A foregut cystic neoplasm with diagnostic and therapeutic similarities to mucinous cystic neoplasms of the pancreas. JOP. 2013 Jul 10. 14(4):446-9. [Medline]. 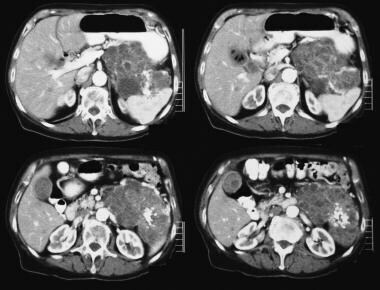 Sahani D, Prasad S, Saini S. Cystic pancreatic neoplasms evaluation by CT and magnetic resonance cholangiopancreatography. Gastrointest Endosc Clin N Am. 2002 Oct. 12(4):657-72. [Medline]. Rickes S, Unkrodt K, Neye H. Differentiation of pancreatic tumours by conventional ultrasound, unenhanced and echo-enhanced power Doppler sonography. Scand J Gastroenterol. 2002 Nov. 37(11):1313-20. [Medline]. 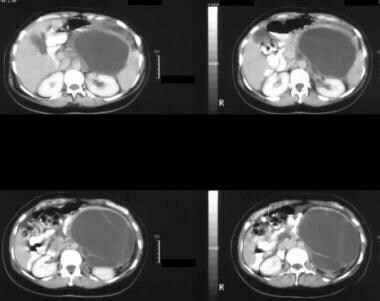 Sperti C, Pasquali C, Chierichetti F. Value of 18-fluorodeoxyglucose positron emission tomography in the management of patients with cystic tumors of the pancreas. Ann Surg. 2001 Nov. 234(5):675-80. [Medline]. Sendler A, Avril N, Roder JD. [Can the extent of pancreatic tumors be evaluated reliably enough by positron emission tomography (PET)]. Langenbecks Arch Chir Suppl Kongressbd. 1998. 115:1485-7. [Medline]. 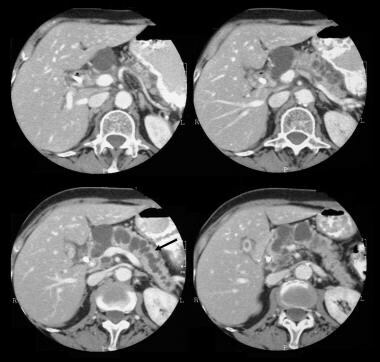 Contrast-enhanced axial CT scans through the tail of the pancreas show a large, enhancing tumor occupying the left hypochondrium, with cystic and solid components. At surgery, a mucinous carcinoma of the pancreatic tail was confirmed. Superior mesenteric angiograms show a hypervascular tumor. The tumor also derives its blood supply from the celiac axis (not shown). At surgery, a mucinous carcinoma of the pancreatic tail was confirmed.